As we near spring some of my friends and yoga clients who love bike riding look forward to another season of getting outdoors. 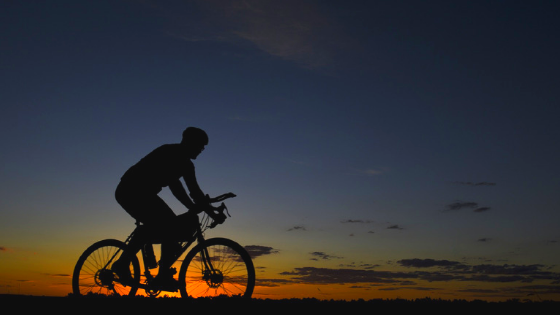 Cycling is excellent fitness; it can significantly improve cardiovascular health and develop leg strength. For those of you who ride often and enjoy longer distances, there is the concern, however, of developing tension in the back, hip, and leg muscles from the static forward leaning and hip-flexed posture. I have found yoga to be extremely helpful in bringing the body’s balance back. A routine that focuses on opening the front of the body, and especially the hip flexors, can ease this tension. As a starting base to warm up the spine, complete a few rounds of Cat (top left) and Cow (top right) Pose. As you alternate between flexing and extending the spine, take note of the balance between these two motions and throughout the various segments of the spine. As you come across any area that feels restricted in the movement feel free to pause and hold the shape to deepen the experience into those areas. Next move to lying on your front (prone lying) and see if you are able to bend one knee and grab your foot to gently draw the heel towards your bum. If it is difficult to reach back and get a hold of your foot, you can use a yoga strap around your ankle to assist. It is important that when you come into the knee bend, the front of the hips don’t lift off the floor—you want to feel grounded through the front of the pelvis, especially on the side you are stretching. If you feel your front hip bones lifting off the floor, back out of the stretch a little and try engaging your abdominal muscles before bending your knee in. If this still doesn’t work, or if you feel any discomfort in your low back, you can do this thigh stretch lying on your side instead. Stay with the stretch for four slow breaths, and depending on the degree of tension you feel, consider doing each leg a second time. Next give Locust Pose a try. It is a great counteractive pose for riders as it strengthens the back extensor muscles (which may be over lengthened and/or weak from the forward leaning posture), and it opens the front body. In this pose you want to engage the back muscles to get a lift of both the upper and lower body, keeping in mind that the height of the lift is totally up to you based on comfort in the back. Also, as you lift the head and chest, let the arms come off the floor as well and draw the shoulder blades together (without shrugging the tops of the shoulders). The legs are lifting at the same time, aiming to get the knees just off the floor and creating a sense of lengthening in the body by stretching the legs back and reaching forward through the crown of the head. Try holding this pose for 3 – 4 slow breaths. As you develop your endurance for this posture, challenge yourself by staying a little longer and doing more repetitions. (Other back extensions such as cobra pose would be suitable here too). For a progression from locust pose, you could build up to doing Bow Pose (right), which really opens all aspects of the front body. Keep in mind, this pose may be too aggressive for the individual with restricted range of motion in the hip flexors or anyone with a back condition compromising their spinal extension, e.g. stenosis. You should be able to do the thigh stretch and locust pose easefully before attempting this pose. After the locust pose and Bow Pose, it tends to feel balancing to come back to kneeling and briefly stretch the back into the reverse motion. Often in class I’ll suggest doing another cat stretch or child’s pose. For Puppy Pose (above), start on all four’s and walk the hands out in front for a long reach under the arms (hands shoulder with apart). You want to keep your hips stacked above the knees. Then let the head and chest relax downwards between the arms to feel the stretching under the arms, along the sides of the torso, and across the chest. Stay here for 3 – 4 slow breaths. Onto the kneeling lunges—probably the most important aspect of this program in order to stretch the hip flexors. The kneeling lunges can be awkward and challenging when you first learn them, but well work the effort for cyclists! Keep in mind it is good to set yourself up for success by adding a little comfort and support in these poses. For instance, you can add padding under the knee on the floor and/or you could do these lunges beside a chair or bench to steady your balance. First come into a high kneeling posture with one foot forward (image top left), and before you shift your hips forward into lunge, lengthen the low back by tilting the tail bone under (posterior pelvic tilt) and maintain this tilt as you lunge the hips forward (image top right). Make sure the front foot is far enough ahead that the knee lines up with the ankle below. The second two lunges, from the images above, demonstrate additions to the basic lunge by reaching the outside arm overhead (image bottom left) and then revolving the body with one hand on the hip (image bottom right) to create greater lengthening down the lateral chain of muscles. On the revolved lunge, I rotate my trunk towards the front knee side and place my outside hand on a block. Instead of a block, you could reach your hand to the ground if this is comfortable for you, or for more height under the hand, you can rest your hand on the chair/bench. Stay in these lunge postures again for 3 – 4 slow breaths each. This posture is for those of you who are ready for a deeper release into the thigh and hip flexor. It is important that you can competently do the previous lunges before adding this one into your routine. With the revolved kneeling lunge, you reach back with the opposite hand to foot to add the knee bend while holding the lunge. In the image above, I am demonstrating with a block under my hand for some support and to lift in my posture. Finish on your back to stretch the hamstrings. In this pose I am demonstrating how you can use a yoga strap to assist the drawing in of the leg and use of the strap to dorsiflex the ankle (toes towards shin) for greater stretch into the lower leg (calf) muscles. Stay in the stretch for 3-4 slow breaths and do each leg once or twice depending on the level of tension you notice. 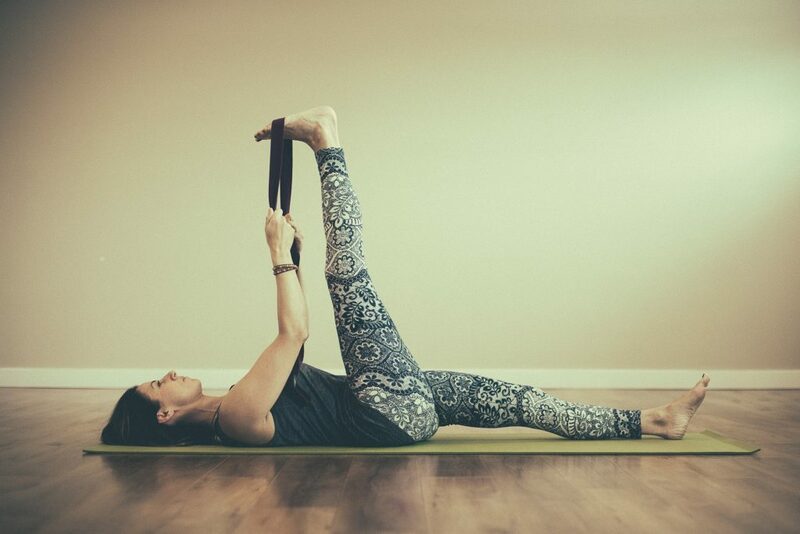 After completing the hamstring stretch, gently draw both knees towards the chest for a little hug, and then extend both legs out, arms at your sides to finish in Savasana, resting on the ground for however long feels good. I hope this routine brings balance back into your body after those long rides and keeps your cycling pain free! This entry was posted in Uncategorized and tagged cyclists, hip flexor stretch, lunges, yoga by Renee. Bookmark the permalink.